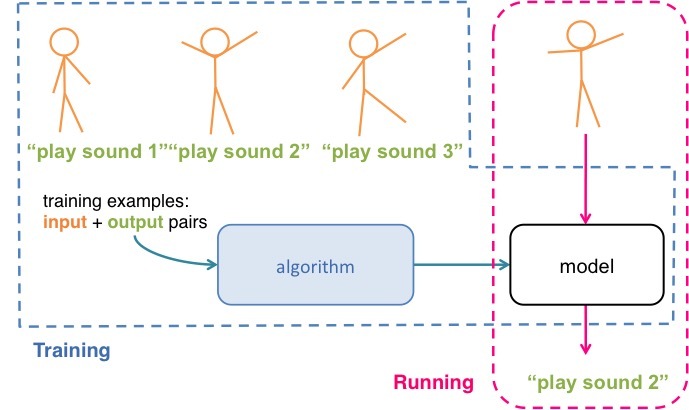 Inputs could be sent from any real-time input, such as game controllers, webcam input, motion tracking, audio input, sensors connected to Arduino, etc. Outputs could be sent to any real-time process, such as music (Max/MSP, ChucK, PD, SuperCollider, Ableton/Max4Live…), animation (Processing, OpenFrameworks, …), games (Unity3D), robots or physical actuators (e.g. using Arduino), etc. Ready to try it out? Head to the Walkthrough.